Grosse Ile, Quebec. 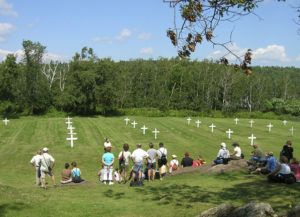 Each grave represents, not a single burial, but a mass grave of Irish immigrants who made it to America and expired. Grosse Ile Campaign: Grosse Ile, a 19th Century quarantine Island on the St Lawrence Estuary, some 30 miles upstream from Quebec City, is the site of mass graves containing the remains of thousands of Irish immigrants who reached the shores of North America but who, due to disease and exhaustion, expired on the island. In May 1993, Mullan was asked by Action Grosse Ile to assist in their campaign to ensure the island was preserved by Parks Canada as a sacred historic site of particular historic interest to Ireland and the Canadian-Irish community. Mullan addressed a public hearing in Montreal at which he told the assembled panel and public that he had come specifically “to ensure that the sanctity of Grosse Ile, as a place of profound Irish significance is protected and preserved. Outside of Ireland, Grosse Ile is recognised by us as the most important and evocative Great Famine site on earth.”. Historian, Marianna O’Gallagher, speaks with President Robinson, during her visit to Grosse Ile in 1994. 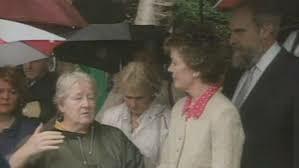 In August 1994, by then working with Concern Worldwide, Mullan was invited to lead a walk from Quebec to Grosse Ile to coincide with a visit by President Mary Robinson to the Island.